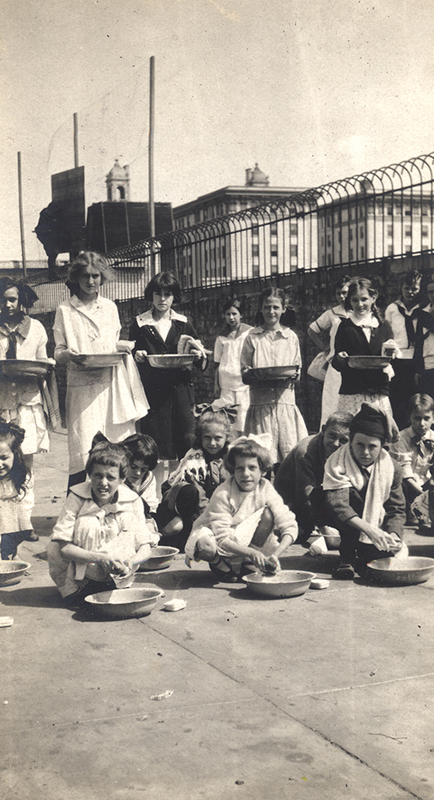 Students from the old Cary Street School (Madison School) in Richmond, Va., demonstrate handwashing before having lunch. Washing hands regularly with soap and water remains one of the most important steps in preventing the spread of many illnesses. The school was located at 219 W. Cary Street, Richmond, Va. The photograph was taken in the early-20th century. Bonis, R. (2010) Madison School, Corner Cary and Madison St. (1872-1973) and Playground Kids, 1940s. The Shockoe Examiner (blog). “Students washing hands before lunch, old Cary Street School (Madison School).,” Social Welfare History Image Portal, accessed April 26, 2019, https://images.socialwelfare.library.vcu.edu/items/show/309.